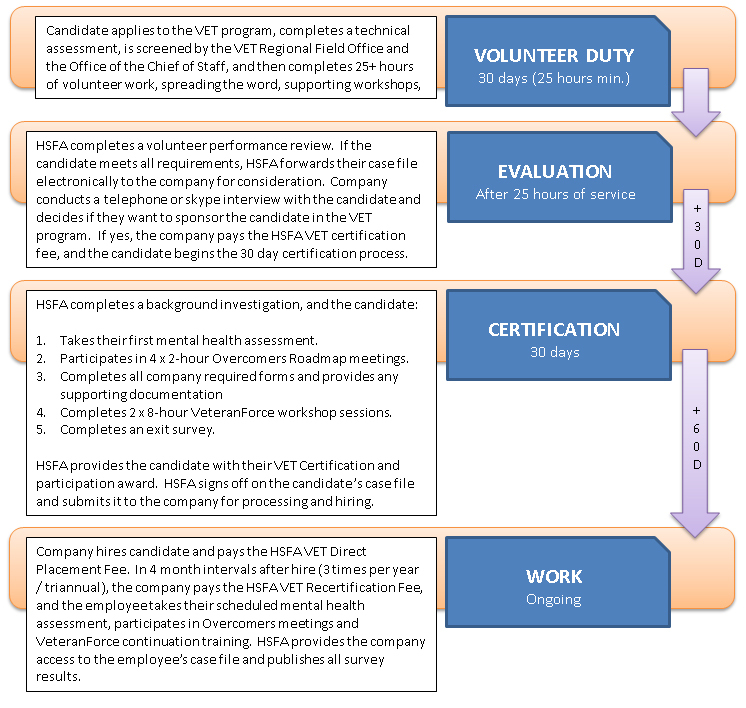 Companies, who integrate the Homeland Security Foundation of America (HSFA) Veteran Engaged Technology Program (VET) into their human resources plan gain access to highly skilled veteran candidates at a fraction of the time, resources and cost of traditional recruiting efforts. As a public 501(c)(3) charity, HSFA is required to offer products and services at less than commercial rates, which helps reduce the cost of recruiting drastically. HSFA recruits and hires qualified candidates to serve as volunteers, so we handle all of the screening efforts at no cost to the company. We develop tailored technical assessments based on company inputs, and all candidates must complete one or more technical assessments before being screened by the VET Regional Field Office and the Office of the Chief of Staff. We then track their work performance in a team setting to evaluate their on the job capabilities. When we refer a candidate to the company for consideration, we’ve already verified the candidate meets or exceeds the job requirements and performs with excellence.